Whew... I'm back friends. I'm feeling much better now thanks to some good sleep, meds and prayers! I'm excited to share one of my new favorite salads with you today. My last few recipes have been slightly sweet, so I thought I would make a salad this week to lighten things up a little. I also needed to lighten my diet this past weekend after I found that insane gelato, so I thought that making this salad would be perfect. This salad is a blend of two things I love: Brussels sprouts and a salad that I LOVE at Ok Cafe, which is a FABULOUS southern food restaurant in Atlanta. I have a version of this salad every time I go there. 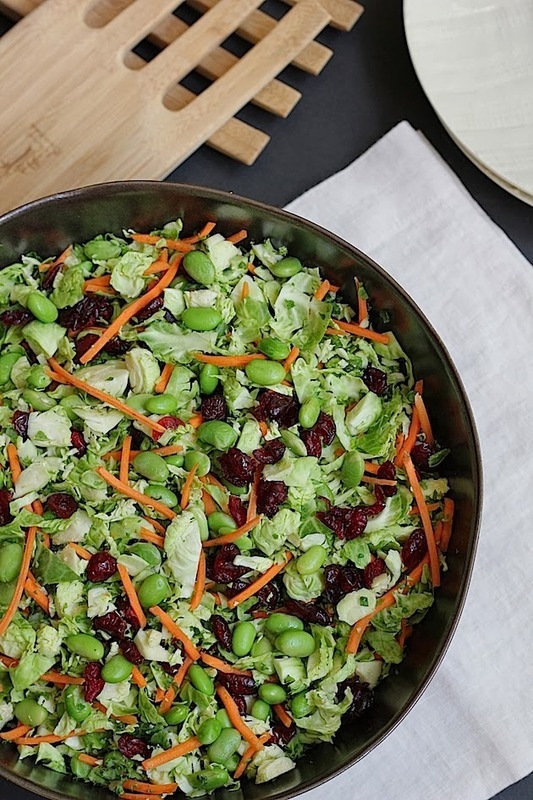 This salad is crisp, incredibly fresh and slightly tangy from the dried cranberries and the dressing. It also has a little bite from the shelled edamame, which is one of my favorite beans. I added some grilled chicken to this after I photographed it to make it meal, but it's so good with our without it! 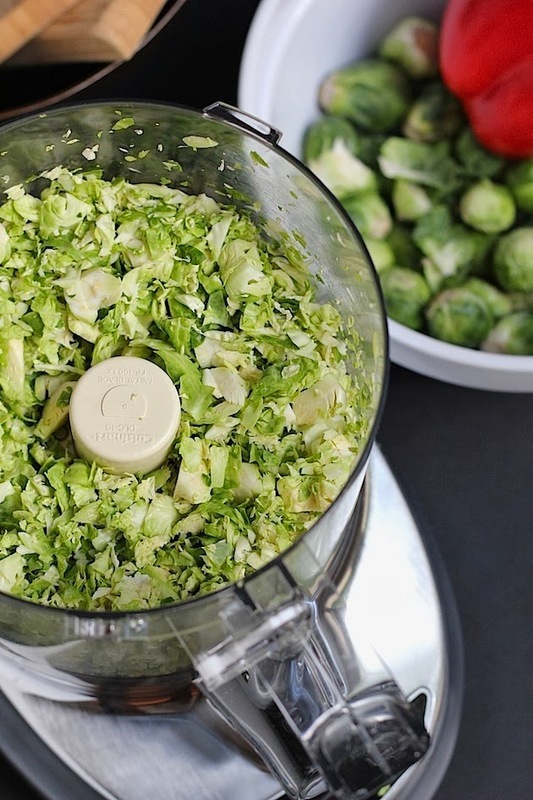 1/ Add the sprouts to a food processor in batches and pulse until they are thinly sliced. Add to a large bowl. 2/ Add the kale to the food processor and pulse until it is finely chopped. Add it to the bowl with the sprouts. 4/ To make the dressing, lemon juice, Dijon mustard, garlic, salt and pepper to a small bowl. Slowly whisk in the oil until well incorporated. 5/ Pour the dressing over the brussels sprouts and kale. Toss until incorporated. Cover the bowl with plastic wrap and refrigerate for at least 30 minutes or up to 2 hours. This will soften and season the Brussels sprouts. 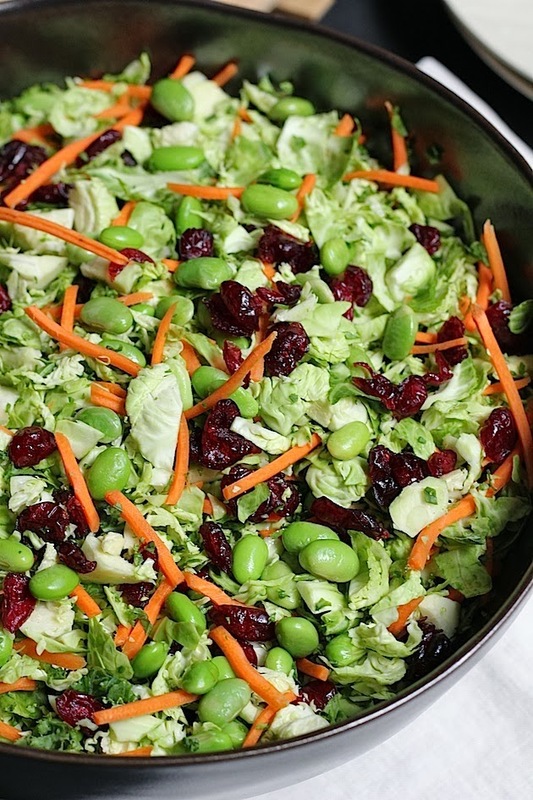 6/ Add in the carrots, edamame and cranberries and toss. That sounds oh so good! I'd definitely make that! This sounds delicious and looks wonderful. oh yum this looks so good Tiff!!! So glad you're feeling better! This salad looks amazing, I love that you tell me what I'm having for dinner through your blog. Such good taste! Looks DELICIOUS! I will try this. Happy to hear you're feeling better! This salad looks utterly fantastic. That's Looks very delicious and tasty, thanks for sharing with us your great Recipe.